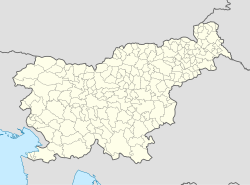 Hudinja (pronounced [xuˈdiːnja]) is a dispersed settlement in the Municipality of Vitanje in northeastern Slovenia. It lies in the hills north of Vitanje at the source of the Hudinja River. The area was traditionally part of the Styria region. It is now included with the rest of the municipality in the Savinja Statistical Region. The local church is dedicated to Saint Vitus and belongs to the Parish of Vitanje. It is a Late Gothic building with extensive 19th-century rebuilding. This article about the Municipality of Vitanje in Slovenia is a stub. You can help Wikipedia by expanding it. This page was last edited on 20 March 2017, at 17:07 (UTC).